What I have learnt over time though, is that getting such images happens most easily when I already have some idea of what I am looking to do in my head and before I am actually in the scene. Camera settings can play an important part in this. It is not always about doing crazy things and hoping the result will be ‘artsy fartsy’. Sometimes you can get unexpected results doing that and it is of course also fun. However, intentionally capturing images that can be called ‘artistic’ is where I believe the real artistry comes in. It did of course take some experimenting to fully understand what the parameters of my camera’s abilities are and how to apply them. I mostly find that the shots I am happiest with are the ones that I deliberately pushed my settings beyond what the norm would be, but with a good idea of what the result would be like. I shoot in RAW, and I do my post-processing in Adobe Lightroom. In processing, I am happy to experiment with sliders and settings just to see what they do. When I am working on an image for its artistic impact, my editing process might not always be the most “technically correct”, and it would be different to the way I might process a more conventional image . Knowing something of what Adobe’s powerful Lightroom program allows me to do after taking the shot has an influence on my shooting decisions in the field. In summary then, my approach is to look for the shot I am after, making use of camera settings, conventional or not, along with an idea of how I will process the RAW image afterwards. Animals with strongly textured skin like elephants, rhinos and crocodiles are good for black and white photos. 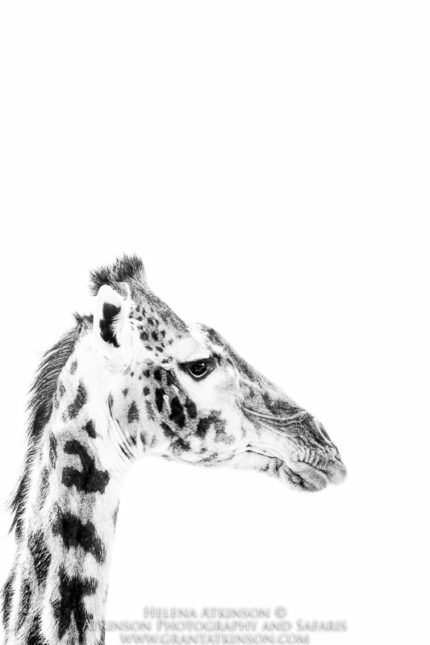 Animals that have their outline defined by dark fur make good subjects for high key images. Prime examples are giraffe, zebra, wildebeest and sable. Animals with long fur like baboons, hyaena, lions and wild dogs can be photographed when the sun is behind them, to give a rim-lighting effect and add interest to silhouettes. 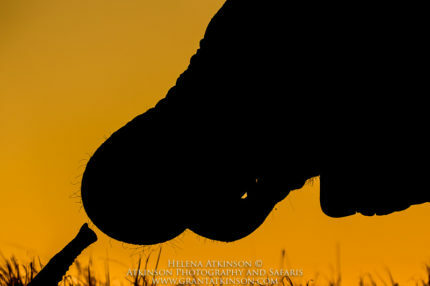 Tall standing animals like giraffe and elephants that have characteristic shapes that are easy to recognize make for good silhouettes. Often when we come across an interesting scene, our first instinct is to start shooting and to grab as many frames as possible to ensure we get the action. I am also guilty of that but after a few seconds, I try and remind myself that in that moment I need to stop taking the same photo over and over and try and change at least one thing. So I will either switch from vertical or horizontal or vice versa, or I will zoom in or out or I will change the exposure compensation on my camera. I shoot only in Evaluative Metering mode. To control my exposure, I really love shooting on M (manual) mode with Auto ISO so that I can do this manually without having to go out of Auto ISO. I find that M-mode combined with Auto ISO really frees me up to work creatively without becoming overly distracted by managing the iso manually. I also really enjoy it when we are working with photographers who are interested and eager to experiment with settings and together we figure out what works and what doesn’t. Strong textures or patterns, mostly in subjects but perhaps also in surroundings. I have used the original images to illustrate my shooting process, as well as the final images. This ‘Before’ and ‘After’ approach, along with a description of the edits I have carried out and the effect, allows me to share my whole image-making process. On an early morning when we where targeting kingfishers on the South African Wild Coast, this grey heron instead caught my eye. 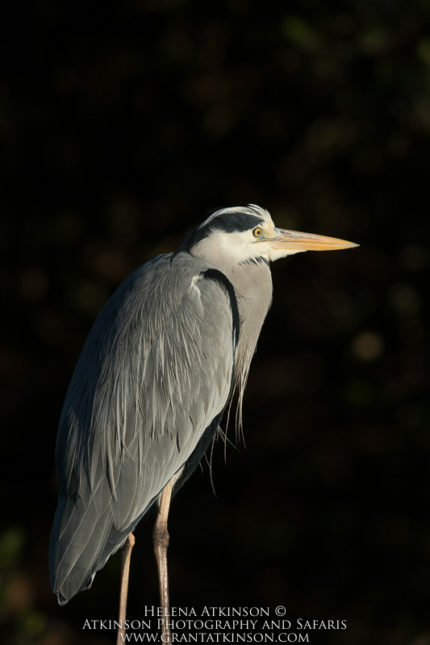 The heron was in full, morning light from a good low angle, but more importantly, had a deep shadow behind, cast by a mangrove tree. This created a kind of natural, ‘spotlight’ effect. 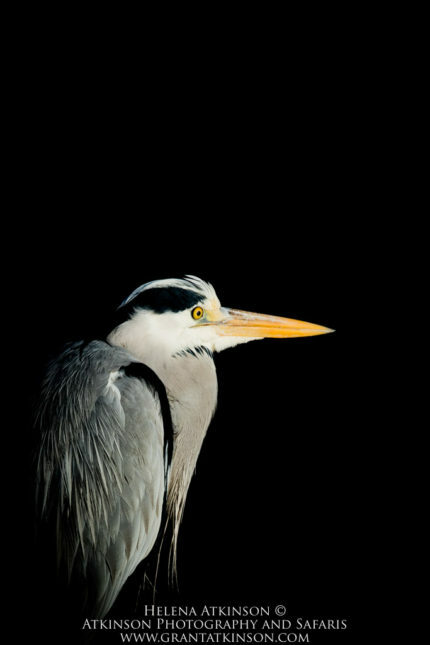 I knew that if I underexposed it would further darken the naturally dark background enough to allow me to effectively isolate the bright heron. I found that -2 EV gave me what I had envisioned with the birds white feathers, yellow eye and bill the brightest parts of my image. Shot in manual, auto ISO with the EOS 80D, 500 f.4 IS II, 1.4 extender with a shutter speed of 1000, f7.1 and ISO 160 and minus 2 EV. Below is the original image with no editing. This is the image after I processed it in Lightroom. In processing, I added more black to the whole image and also added a dark vignette around the edges. Adding back a bit of yellow on the beak and eye and some brightening of the bird using the adjustment brush gave the me the shot I was after. We were driving in the Serengeti in Tanzania when I saw this tree and noticed that there was a thin line of space between the leaves and the horizon. I was also immediately drawn to the clean background in this scene. 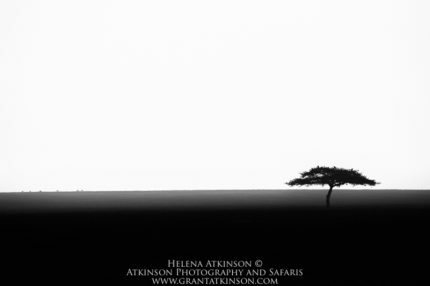 My immediate thought with this image was to convert it to black and white so I set my camera to underexpose by 1 full stop as I was not too concerned with the detail in the foreground and the main focus of the image was the silhouette of the tree. My settings for this image was 1/1600 sec shutter speed and aperture of f9 at iso 100. Here is the image as captured. Below is the processed image. In processing, I used the whites slider to brighten the sky, happy to have no detail showing in the sky, and also the blacks slider, adding black, to darken the foreground and the tree and keep them deep black. Overall that increased the contrast between the bright sky and the dark tree. I also used the clarity slider from the basic panel on the whole image, which brought out the hazy, atmospheric distant hillside somewhat. Although the clarity slider can make noise become more visible in parts of an image if used heavily, the fact that I took this frame at iso 100 meant that noise levels where very low. One of the most fun ways to be creative in the field is to overexpose certain scenes and specifically certain subjects, with the aim of getting an effective high-key image which can still be processed further. Sometimes these kind of shots can still be well captured, even when the sun is a little high in the sky and it might be considered no longer ideal conditions for conventional shooting. It can actually give you more time for photography as it can work very well in harsh sunlight. 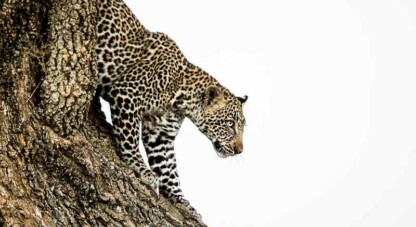 In fact often on the way back from a morning game drive to camp is when I will take these photos, sometimes after others have already stopped shooting. Through trial and error I have learnt that some animals are more suited to this effect than others. Some of my favourite species are giraffe, hyaena and zebras. All of these animals have dark fur/spots/stripes that helps define the outline of their shape, all the way around their bodies, even when the white or bright parts of an image are overexposed a lot. It doesn’t work well where too much of the animals shape is completely erased. You still need to be able to easily see what the animal is, and the dark parts of the overexposed subject are responsible for this. I also often prefer head shots only for this technique as I don’t always like what happens to the legs when they are standing in tall grass and the grass blows out completely. Again, to me it looks like you simply erased parts of the legs. But that is just a personal preference. I typically overexpose my images anywhere between 1 full stop, right up to 4 full stops. 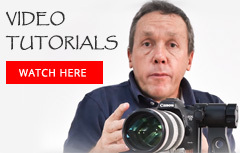 What is very important is to remember to set the overexposure back to zero after getting your shot. Forgetting to set the exposure compensation back to zero can lead to big frustration if you accidentally shoot your next subject at +3EV. Trust me on that one! My settings for the giraffe shot where shutter speed 1/1000 sec at f4.0, ISO 800. Exposure compensation was plus 3.67 stops (EV). Below is the image as captured. In processing I converted the image to black and white. The most important editing step was to add back more black, and also to add contrast until I had the clean look I was after. 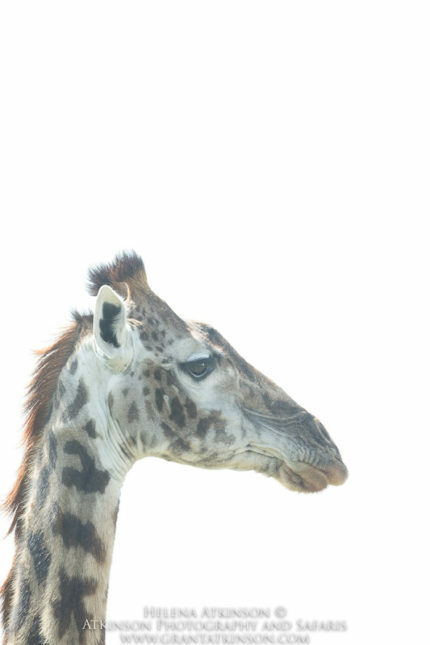 The dark mane, fur on the horns and on the muzzle, and that deep black eye keep the giraffe shape clear and strong. Its hard to beat mother and baby interaction when it comes to wildlife images. The image under discussion here is one of my all-time favourites. We where on the Chobe River, Botswana, and working from a photographic boat. We made sure to drift our boat quietly and carefully toward an elephant herd that was milling about beside the river. Our cautious approach meant the elephants remained completely relaxed and went about their business with no concern for our presence. It was at a time of year when smoke from distant grass fires was casting pink and orange hues to the sky. I noticed some touching interaction that was taking place between an elephant mom and her baby. My settings where already in place for creating a silhouette as I was underexposing and I was able to place my focus point on the tip of the babies tiny trunk as it reached out towards its mom. I knew that with some processing of the raw image, the colour in the sky could be teased out. My settings for the shot where shutter speed 1/2500 sec at f5.6, ISO 125. Minus 2.33 stops (EV). I knew that with some post processing I could pull out more colour in the sky and that I would be able to get a silhouette of the elephants if I underexposed the scene. 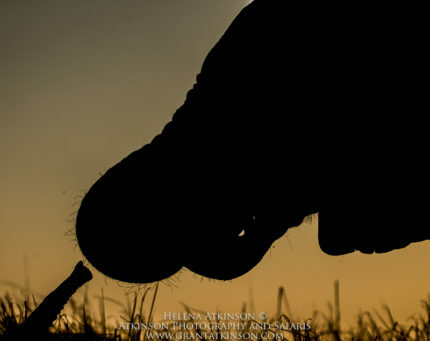 I was very lucky that I spotted this little interaction and that by having my settings ready for creating a silhouette I managed to put the focus on the little baby elephant’s trunk reaching out to its mother. I have actually titled this image “The bond”. My settings for this image was 1/2500 of a second at f5.6 with an ISO of 125. I underexposed the image by 2 and 1/3 stops. Below is the scene as it was shot. Below is the image that I processed in Lightroom. I warmed up the image by pulling the temperature slider to the right. 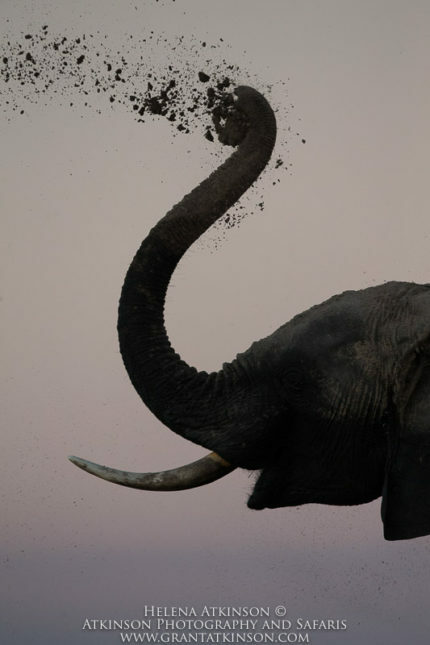 I also added more black to the elephants to make the silhouette stronger. Rim-light is an effect that I am always on the look out for. It happens when an animal with long hair or fur has the sun shining from behind and just the outer edges of the hair catch the light. I love making the image darker by underexposing, and leaving only enough light on the face that the brightest details are suggestive rather than overly detailed. This kind of light and shooting technique works very well for animals that have distinctive shapes and long, coarse hair. 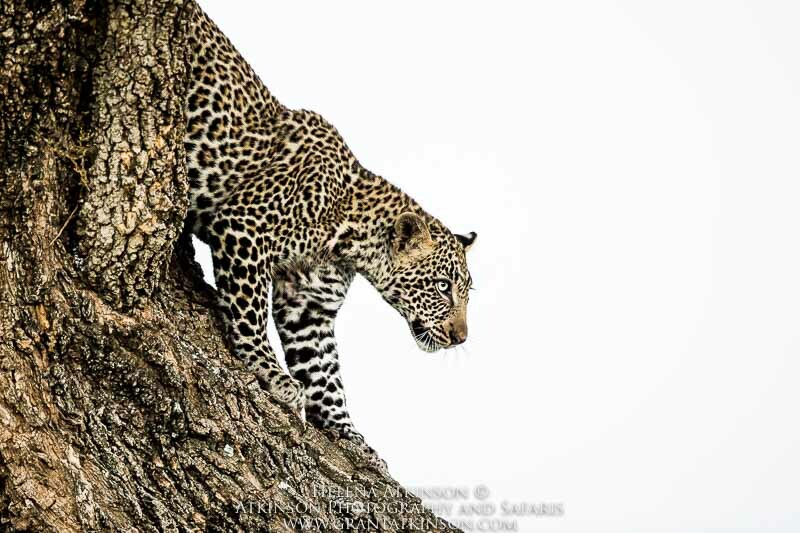 Male lions as well as African wild dogs and spotted hyaenas are good subject matter. Chacma baboons are particular favourites of mine and some of the best opportunities come when they are sunning themselves along the banks of Botswana’s Chobe River. 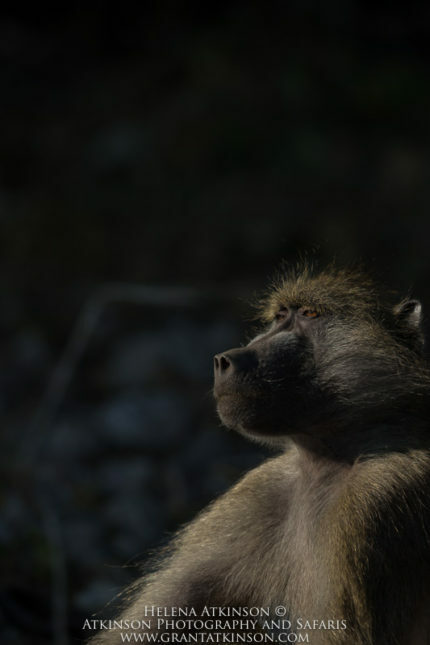 For the dramatic rim-light effect to work well, you need the sun to light up the baboons from behind or from the side. 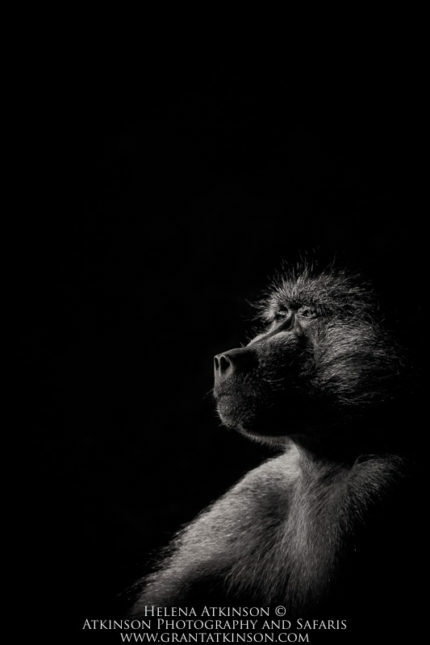 You also need to position yourself so that there is a dark background behind the baboon. I underexpose enough to get rid of any bright distracting areas in the background, but not so much that I lose all the critical detail on the animal (depending on how much you want to keep). With baboons I like to keep their eyes as part of the image as this is what really speaks to me when I photograph them. I am always amazed at the soulful expressions primates have when I look at my images afterwards. For this particular image I had a shutter speed of 1/2500sec at f5.6, and my ISO was 125. I underexposed by 2.33 stops (two and two-thirds EV). I was working with a fast shutter speed as it meant I would be ready to shoot action if it should happen. Below is the image as I took it on the day. Here is the image after I processed it in black and white. A very useful editing tool for this style of photography is to add a dark vignette. It is a quick way to darken the area around a subject. Something I always challenge myself to look out for is the opportunity to capture abstract images which may come about from only photographing a part of a scene or animal but in such a way that it is clear what my intention was. Elephants, zebras along with crocodiles are some of my preferred subjects for this kind of image. If you are working in or around water, then reflections can add a whole lot to the composition. 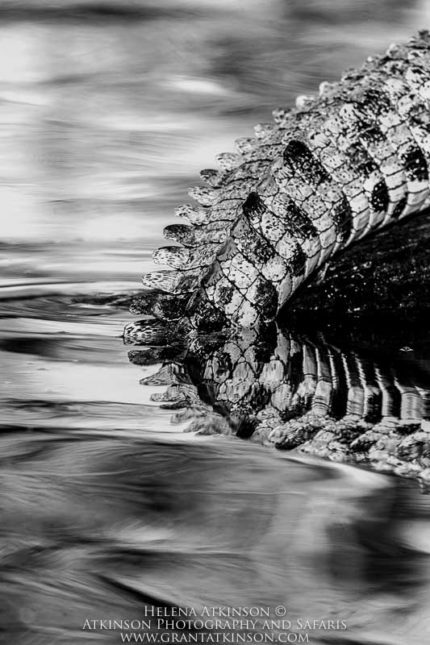 Coming across a basking crocodile that was draped along a dead tree stump provided a great opportunity for an abstract capture. 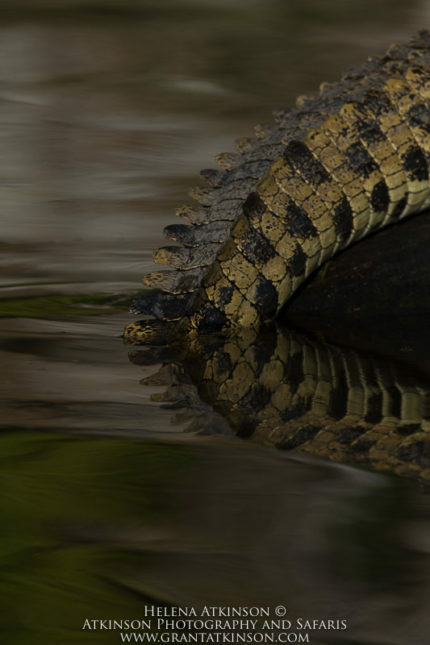 Rather than trying to photograph the entire crocodile and the log, I chose to frame the strong shape formed where the reptile’s tail entered the water. The meeting point between tail and water just stood out for me. I knew that I would most likely convert the image into a black and white picture and that I would need to be careful of the bright reflection in the water blowing out, so I underexposed the scene by 2 stops. (Minus 2 EV). My shutter speed was 1/800 sec at f7.1 and my ISO was on 100. Here is the scene as it was taken on the day. Below is the image in black and white. I also like the colour version of this image but I ended up converting it as I liked the fact that it became even more abstract and black and white. I often use the Nik Silver Efex Pro 2 when I process in black and white. This image was absolutely me in my happy place. I love photographing elephants and really focusing on the creases in the skin and when you can add the shape of the trunk and the tusks (or tusk in this case) in a side profile then you can have some real fun. In this case we had the added bonus of the elephant dust bathing and this added a lot of visual interest in the sky. We where photographing from a good low angle, which meant that we had a good clean background for the elephant. This is something that I seek out in my images. So I immediately saw in my head that I would want to do a black and white image with a focus on the texture of the skin so I did not make any exposure compensation adjustments. I did also think that the shape of the trunk would be the key focus of the image, so even though the soft colours in the sky were beautiful, I though that a black and white image would make that the focus of the image. My shutterspeed was at 1/800 of a second and I was at f5.6 with my ISO at 4000. The light was getting low so these settings were to work around that. If you zoom in on this image you will see that there is a fair amount of noise showing up in the elephant (emphasised a bit in the way I processed it) but this is not something I fuss about too much especially in a black and white image or when my subject is an elephant. The fine grain imparted by noise can render in a very pleasing way when printed large, depending on the print medium of course. Below is the image as I shot it on the day. Here is the processed image. During editing I converted the image to black and white and then I brushed the elephant with the adjustment brush and I pulled the clarity slider to the right. That brought out the texture of the elephants skin and the mud. What is really fun as well about this approach is that there is really no right or wrong. I take photos that I like and I edit them in a way that gets me excited and makes me want to get out and take more. I also like to use the parameter of asking myself, would I like that printed out big and on my wall. If the answer is yes, then I get very very excited and am happy with the result. 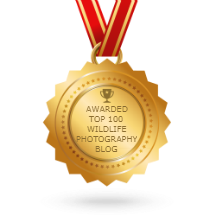 Off course I value other people’s opinion and get great pleasure from someone liking my photos and my style, but more than anything I enjoy producing an image that I think shows a different way of seeing the world and that adds a whole other layer to wildlife photography. Very interesting and engaging photos. Thank you for explaining in such great detail how and why you edited the photos. You have given me some ideas for my Louisiana bird, reptile, swamp and wetlands pictures. Dear Don, thank you for taking the time to comment. I am glad you found this useful. Would love to see some of your photos as well. Do you maybe have a website where you post? Thank you for this article! As Africa is out of my reach I like to think about how I could try some of these techniques with cats or other animals. Very insightful and good explanations! Thank you Sabine for taking the time to comment. All the best for 2019! I’m taking my Pentax 67 to the Kruger National Park this year and I’ve been browsing articles on black and white wildlife photography for inspiration. This piece – while dealing with more than just black and white – is by far the best I’ve come across. There are quite a few ideas I can take forward from this. In particular it hadn’t for some reason occurred to me how I could use the sky behind an animals head for a high key animal portrait. Great piece and excellent images. I love your artistic approach to photography, Helena. There are many wonderful examples of superb photographs that follow the traditional path, including some of yours and also Grant’s photos. But using different techniques makes one look at opportunities so differently and really let your mind expand into areas that are beyond that traditional ‘eye’. Maybe the light is low and you think there is no use even snapping one photo. But then you try a few non traditional shots and if just one comes out interesting, great! In the digital age, it is so easy to delete! Terrific article and I love that black and white!! !